It was meant to be a “sweet” day for some police officers in Clearwater, Florida and the homeless. The officers recovered a stolen van filled with Krispy Kreme doughnuts. The store manager decided to donate the doughnuts to the hardworking officers. The gentlemen got some of the sweets for themselves but opted to hand out most of the doughnuts to the homeless in the area. The van was reported stolen Tuesday morning in Lake City, about 193 miles or 310 kilometers north of Clearwater. It was recovered by an officer on patrol in Clearwater. The thief appeared to have abandoned the vehicle. The store manager probably felt it would no longer be safe to have the doughnuts brought back to the store given the time that has passed so he made a call to reward the officers with something sweet that day. 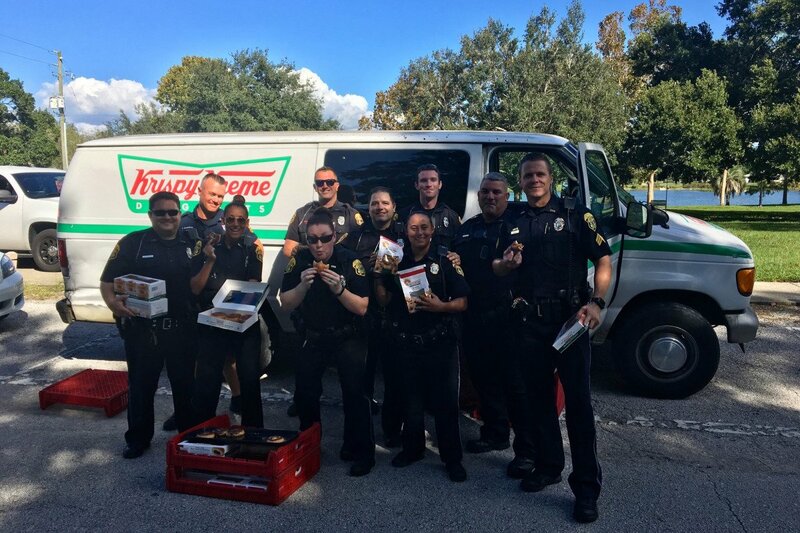 A homeless meal event was happening coincidentally down the street so the officers found the perfect opportunity to share the loot, er, blessings of free Krispy Kreme to the homeless. The feeding event takes place several times a week and benefits several dozens, homeless people. Clearwater police also posted a photo on Facebook of the officers standing in front of the van holding boxes of the popular treats. They’re just happy for the unexpected event, but they’re not the product’s new endorsers. The van thief is still unidentified.